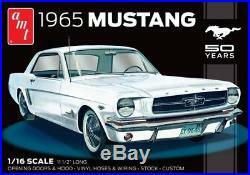 1965 Ford Mustang 50th Anniversary Large 1:16 Scale AMT Detailed Plastic Kit. Without question, the Mustang was one of Ford's all-time better ideas. Introduced at the New York World fair in April 1964, the first "pony car"- as this new breed of small, sporty machines was labelled - was an instant hit with drivers of all ages. The Mustang's racy long hood and short deck proportions were all things to all people - from the sporty to the supermarket set. Even the base model came with a plush interior: vinyl upholstery, bucket seats and a floor mounted shifter. The model was offered in a hardtop and convertible form with the later addition of the 2+2 Fastback. To commemorate the 50th anniversary of Ford's Mustang, AMT reintroduced its super-detailed 1/16th scale 1965 Hardtop. With many features including opening doors and hood, folding seats and vinyl tubing to emulate wiring and hoses for the motor, this superb model builds into an authentic replica that is some 11.5 inches in length! Super-detailed 1:16 scale kit. Skill Level: 3 (ages 12 and up). Stock and "Cobra" engine options. Stock and custom mag wheel and tire options. Vinyl tubing for motor ignition wire and radiator hoses. The item "1965 Ford Mustang 50th Anniversary Large 116 Scale AMT Detailed Plastic Kit" is in sale since Wednesday, November 15, 2017. This item is in the category "Toys & Games\Model Kits\Models".